I just received my black XP-L HI 3A blemished one at a discount from Fireflies. If it wasn’t stated that way, I wouldn’t even notice any blemish at all. My initial lumen measurements were 5,431 lumens at 1s on freshly charged VTC5D. However, like my other ROT66 that were making low lumen output, putting a spacer between the tail cap and battery cage increases contact pressure between the battery cage and the head, which increased lumen output to 6,940 lumens! I suggest everyone use spacers (e.g., folded napkins, rubber bands, etc.) and remeasure your lumen output. Two of my ROT66 had this issue with not enough compression at the contact point causing low output. The compression force relies on the resistance of the rubber in the tailcap pushing up on the battery cage. However, over time, the rubber gets permanently deformed and loses its elasticity so there’s less rebound pressure pushing up against the cage. For those people that leave the battery cage tightened in the flashlight for a period of time, retest your lumen output. I’m pretty sure it is a good amount lower than when it was brand new. I like the tint on the XP-L HI 3A alot. It is about 5200k, a very clean NW/CW and when compared next to 219B 4500k doesn’t look green at all unlike many other flashlights. However when shined on actual objects and not just white walls, the 219b 9080 still does a far superior job at color rendering. The XP-L HI runs cooler though. I have my three rot66 stand by for 5 days after fully charged.. Sorry to hear some of you people have a high drain stand by..
You can change the brightness on the aux leds? How do you do it? I borrow the light from skylumen. Ask him. There are Phillips-head potentiometers on the aux LED board. Someone had it drain three full cells in a few hours. Whatever was wrong, it wasn’t any regular sort of standby drain. It’s probably a short of some sort. I have my three rot66 stand by for 9 days after fully charged.. The ROT66 standby drain should be between ~0.03 mA and ~0.70 mA, depending on the exact model and configuration of the light. At worst, it should take at least a year and a half to drain three 3000 mAh cells. So… if something drained them in under a week, there’s something else wrong. Out of the box, are the aux led’s bright enough to walk around a dark room with? What if the potentiometer is cranked up? I will get FF to look into it. My ROT66 didn’t have Aux-LEDs, but my D4S has. When the D4S aux-LEDs are configured to “High” mode, they’re nearly as bright as the main light on the lowest “Moon” mode (maybe 1 lumen or a bit less)? Certainly enough to walk around a dark room with. When the D4S aux-LEDs are configured to “High” mode, they’re nearly as bright as the main light on the lowest “Moon” mode (maybe 1 lumen or a bit less)? Certainly enough to walk around a dark room with. The D4S aux LEDs go from about 30 uA to 1000 uA, on low and high. This is controlled by the firmware. The ROT66 aux LEDs go from about 200 uA to 600 uA, ish. This is controlled by a screwdriver. Ordered one “glued”, as it was going to be a gift. All emitters come on when the light is cold. as soon as it heats up one emitter shuts off. And then another one starts giving up. So after a few seconds on turbo, two emitters are off. So this has turned into a test of the FF 3-year-warranty/customer support. Sent them a mail three days ago, no response yet. PM him on here. I had a cosmetic issue with one of mine and Jack went out of his way to do anything he could and there was nothing he wasn’t willing to do. This was just recently. I’m sure he just overlooked your email with all that’s going on. does that only happen on turbo? Like normal ramping it’s fine? Always the same two? He’s sending me a battery carrier to see if it fixes my battery drain problem. No charge. No hesitation. I just got my rot66 xpl hi 5000k.. i bought the one with the scratch to save some money.. the scratch is just on the bezel. i cant believe sony vtc5a give 1000 more lumen than samsung 30q. i cant believe sony vtc5a give 1000 more lumen than samsung 30q. The 30Q is a nice mix of high capacity and still high current. Capacity and current is always a trade-off. If you don’t mind less capacity, you can get higher currents. For example, the Sony VTC4 2100mah can deliver even higher currents than the VTC5A at around 30A continous. So you just choose what’s best for you. Can the aux LED potentiometer be accessed on a glued ROT66? Or do you need the unglued version for access? Thanks. You would need the unglued version for access. This is one cool light, just got my champagne sst20 scratch+dent. Tint is spot on at 4K. 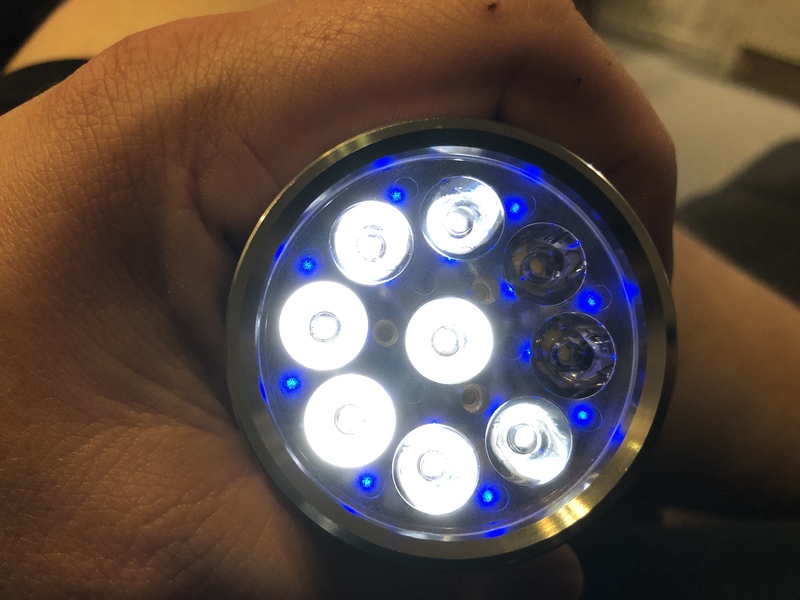 Ideal beam and tint for a Mtn bike light! I received my ROT66 today, black Nichia 219B option. Normally, I’d say the 219C’s in my D4 look about as neutral as one can get. Compared to this ROT66, a hint of green tint shows up in the D4, while the ROT66 does lean ever so slightly pink. I’m enjoying playing around with the many features of Anduril. Has anyone sourced a diffuser yet? I am looking for something with a pretty snug fit. Thanks! The diffuser Neal is selling for the GT Mini is a bit “loose” when used on the GT Mini, but it actually fits quite snugly when used on the ROT66 instead..
onieanjal – Is my picture showing up for you, two posts above yours? Cutting the diffuser from an LED light bulb down to rest on the ROT66’s head like I did should be pretty simple if you have a Dremel, hacksaw, or other means of cutting plastic.